You must have seen Burger King's new chicken burgers. "Never chicken out on real spice" is what they tout as lesson one of "The BK Way of Chicken". 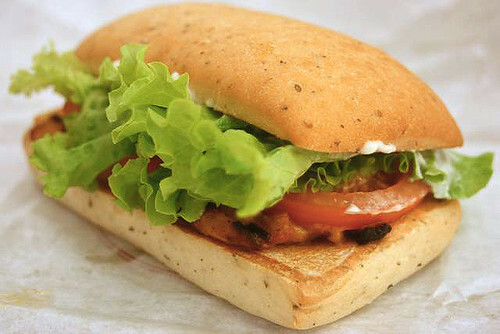 This is the BK Spicy Panini Tendergrill Chicken Sandwich (about S$5.95 a la carte, S$7.95 with meal; prices may vary at different outlets). It features thigh meat marinated in spices including cayenne pepper, black pepper and hints of mustard, onion powder and celery seed. OK, yes, you can taste the mix of spices, but in terms of chili heat, it's pretty harmless. Good for folks who can't tolerate spicy food. Just a little meh for those of us who like to chew on chili padi. The patty is also on the sweetish side, as is the 'Mediterranean' inspired bread (flavoured with rosemary and oregano). Bit too sweet, but that's me. 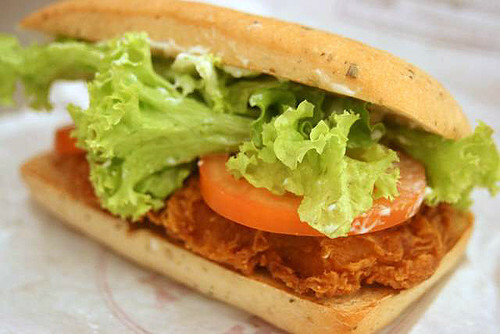 The BK Spicy Panini Tendercrisp Chicken (about S$5.50 a la carte, S$7.65 with meal) also uses thigh meat, but this one is a deep-fried patty. Spices used here include capsicum, garlic powder, rosemary and chili oil. This one fared better with us. I mean, it's hard to beat anything deep-fried, and with crunchy batter! It was nicely seasoned too. Savoury (I like!) rather than sweetish like the grilled version. I just wish the patty matched the size of the bread. I had an inch of empty bread at one end. By the way, have I been under a tortoise shell too long? A small Coke at the ION Burger King now costs S$2.70! No wonder we are now officially a more expensive city than Hong Kong! Burger King's been pushing out a slew of new temporary products this year (stuffing burgers with onion rings, nachos and such). Personally I'd rather they focus on maintaining the quality of their regular items and QC across outlets. Then they'd really be king. S$2.70 for a small coke. You make an excellent point which many, if not most Singaporean restauranteurs fail to understand. If the price is too high, the customers don't buy, the food spoils and they end up feeding it to their employees or throwing out the food. Walk around Suntec's restaurant row any Monday through Thursday, and look at all those empty restaurants, including Burger King. The only restaurant running full are the food courts and McDonalds selling S$5 meals. In the US, a small coke in any fastfood restaurant is US$1.25; the cashier gives you an empty paper cup and it is freefill. In the US, the big burgers (whopper, Big Mac, Carls Jr. Famous Star) are US$2.25 max and most BK or McD are running full. Similar to Singapore, the rent is astronomic in San Francisco, or NY City, but the price of the burger is pretty much the same. The Singapore BK franchisee must have his head up his a**. Gee..I did not know a small coke is $2.70. Thats more than enough to buy a 1.5 litre bottle. I suspect the pricing is only at that particular ION outlet. The prices vary according to locations. They didn't have prices of beverages up on the menu boards (well, none I could find). I had actually fished out S$2.50, thinking that for sure I would get change back. *gulp* I had fork out more! Considering ion rental... $2.70 is pretty cheap. The expensive price you pay are not paying the chefs. Still is one of the worst paid job in singapore. What you are paying is mainly the rental of the place and food cost. Who wouldn't want to serve cheaper food so more customer would try? FIY a simple coffeeshop stall 3-5k, foodcourt can reach up to 10k. If a hawker selling chicken rice at $2 or $3 how many plate he will need to sell to cover the rent then cover the food and operational cost?